This article will tell partition magic with which you can perform partition resizing on Windows Server 2012 64 bit without losing data. Download IM-Magic Partition Resizer Server to resize hard disk on Windows Server 2012 64 bit Operating System. Windows 2012 only supports 64 bit Operating System, which has some improvements compared with the previous Server Operating System. However, Windows Server 2012 users are still troubled by some problem when the disk partition is running out of disk space. Although Windows Server 2012 has some improvements, its users still need to repartition hard disk when partition is running out of disk space. Now, with the partition software IM-Magic Partition Resizer Server, you can easily resize hard disk and reallocate disk space without repartitioning hard disk or reinstalling system. This partition software enables you to resize partition Windows server 2012 64 bit and other Windows Servers. You need to download, install and run IM-Magic Partition Resizer Server on the Server computer. Then, you can right click a partition that has free space and go to "Resize/Move" option. When mouse shows double arrows symbol, you can move the arrows to shrink the selected partition. Then, you can get some unallocated space after shrinking the partition. You need to move the unallocated space close to the partition that is running on low disk space. Then, right click the partition and go to "Resize/Move" option. Move the arrows to add the unallocated space to the selected partition and choose "Apply" button. "My PC runs under Windows Server 2012 64 bit Operating System. I have a SATA hard disk which was divided into two partitions on the PC. One partition (C drive) contains some programs and system files, and the other partition (D drive) contains all my work documents and some videos. 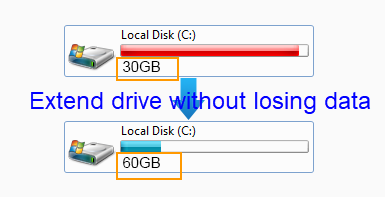 Since C drive only has little free space left, I want to move some free space from D drive to it. When I open Disk Management, the Extend Volume is grayed out. My friend recommended a partition tool and told me it can help me resize hard disk without repartitioning. However, when I attempted to install the program, it said that system does not support the program. Can you tell any partition software that can be compatible with Windows 2012 64 bit?" "Is it possible to increase size of system partition on Windows Server 2012 64 bit without hurting the system? Please tell me the detailed solution for system partition resizing. Thanks!" When you are running out of disk space on Windows Server 2012 64 bit, you can download the partition software to resize hard disk. IM-Magic Partition Resizer Server can be fully compatible with Windows Server 2012 64 bit for partition resizing. It does not allow you to repartition hard disk, but it enables you to move free space from one partition to another so as to fix low disk space issue. What you should know is that you can only move free space on the same hard disk. You cannot move free space from one hard disk to another hard disk. This partition software supports all brands of hard disks to help perform partition resizing. If you want to system partition, you may worry that it will cause any damage to the Operating System due to partition resizing. It is true that system partition is quite important on a computer, which may have influence on the performance of your computer. 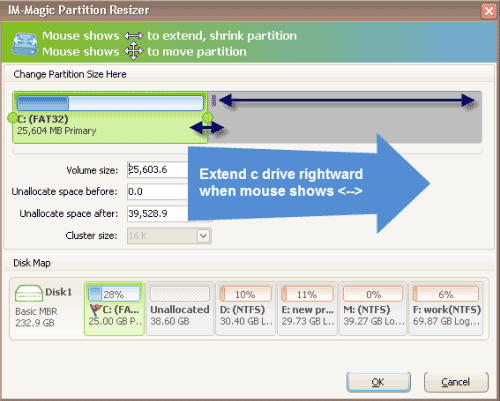 IM-Magic Partition Resizer Server provides a safe way to resize hard disk without touching the Operating System. It will do no harm to the partition or system during partition resizing. This partition software supports both NTFS and FAT32 file system. Many people would like to delete some unnecessary files or move files to another storage media in order to free up disk space when a data volume is running out of disk space on Windows Server 2012. It might be able to resolve the problem thoroughly, but deleting or moving files can only free up little space. Besides, it will be terrible if you mistakenly delete some important files. If you can use the partition software to resize hard disk instead of deleting or moving files, it provides easy way to increase the size of disk partition without losing any data. You can move free space from another data volume to extend the volume that is running on low disk space. You can also move free space from a system partition to extend a data volume.